In October of 2002 Leah and I got photos taken of our irises from this really interesting cat we met at a web design meetup. I _think_ it was a webdesign meetup, anyway. He had this crazy setup to take pictures of your eyes. The technique was digital. 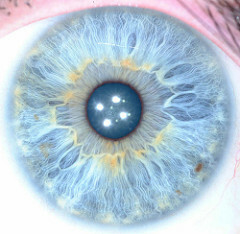 The fellow had lots of ideas about iridology, and what the shapes in your eyes tell about your general health. I didn’t buy it, but it was a fun pseudoscience. He also said another branch of iridology that would tell you about your love life. He thought that stuff was bogus. Leah did a great painting based on my eye. That painting now hangs on our bedroom wall. 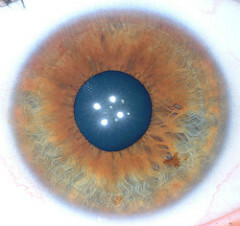 Iridology is a form of alternative medicine in which patterns, colors and other characteristics of stromal fibers of the iris are examined for information about a patient’s systemic health. 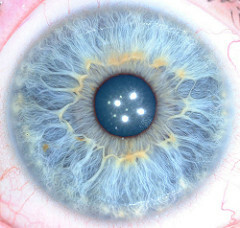 Practitioners match their observations to iris charts which divide the iris into many zones believed to correspond to specific parts of the human body. 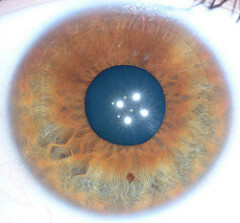 Little if any rigorous scientific evidence exists confirming any such link between aspects of the iris and a patient’s state of health and there is no recognized causative mechanism for any purported correlation. I think the images don’t have to indicate anything about my body or love life to be amazing and beautiful. And it was an honor to have my eye turned into a painting. I seem to remember a conversation my father a long time ago about abstract art: he said that you could have amazing abstract art if you just did blow ups of photographs of things at a microscopic level. I agree with that. The natural world is full of wonders. Joe Crawford blogged this at 5:15pm in 2005 in August. The 2nd was a Tuesday. You are reading this 14 years later. Comment. There is one comment Tweet. Send email. It has hashtags→ eyes iridology leahpeah memories photos .